Building on the popularity of the Tungsten E handheld, which has sold nearly 2 million units worldwide, palmOne today announced the Tungsten E2 handheld. Some of the additions include a brighter color screen, flash memory, Bluetooth wireless technology and a more powerful battery. "This sleek, stylish device is the perfect handheld to take into the boardroom or the classroom," said Ken Wirt, senior vice president of worldwide marketing for palmOne. "With the versatile Tungsten E2, customers get more of what they want -- Bluetooth, and a brighter, richer color screen that brings calendar, contacts, documents, photos and videos to life. Plus, flash memory to keep important information safe, even when you forget to charge the device." The Tungsten E has proven enormously popular with budget-conscious professionals and consumers alike, helping it achieve a remarkable 17 months of sales-leading statistics, according to The NPD Group. 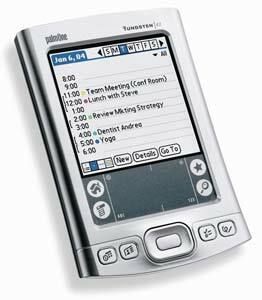 Introduced in October 2003, the Tungsten E represented a new way of thinking about an enterprise-class handheld. Whether for home or in the office, individuals no longer had to sacrifice price for performance or professional features for multimedia. Instead, palmOne designed Tungsten E from the ground up to include cutting-edge features for work and play at an affordable price. The Tungsten E2 handheld has a new, 30% brighter 320x320 color display, making it easy for professionals and consumers to see their schedules, contacts, and work documents -- indoors and out. Better color saturation brings photos and video clips to life in rich, dazzling color. 32MB of non-volatile flash memory with 29.7 MB actual storage capacity gives Tungsten E2 handheld users more than enough room to hold their calendars, contacts, applications, photos, spreadsheets and presentations. The Tungsten E2 battery provides longer battery life than the original Tungsten E. And because it's flash memory, the information on the handheld is protected -- even if the battery happens to run out. The TE2 has dimensions of 4.5 x 3.1 x.59 inches (114 x 79 x 15mm) and weighs 4.7 ounces (133g). The Tungsten E2 becomes a portable MP3 player. Users simply plug in an expansion card loaded with their favorite MP3s and use the built-in speaker or stereo headphones. Photos or video clips of friends and family can be carried across town or around the globe by inserting an SD Card from a digital camera to show off photos on the Tungsten E2's color display. The Tungsten E2 comes with DataViz's Documents To Go software, which lets mobile professionals carry important Word, Excel and PowerPoint files so they can be more productive wherever they are. And with a simple conversion step, Acrobat PDF files can be viewed. The Tungsten E2 handheld comes with a 200MHz Intel XScale processor and 32MB of RAM (29.7 MB user available), providing the room and speed for complex documents or applications. The TE2 runs Palm OS Garnet v5.4.7. The built-in expansion card slot accepts MultiMediaCard, SD and SDIO formats, with support for palmOne's WiFi SD card. Looks like the rumors were true (and, surprise surprise, the FCC photos weren't fake). Nice to see that the WiFi card is supported. You know, on the one hand, updating the T|E is sorta boring. On the other hand, this is a nice update to a successful little unit. 3. As the 1st poster pointed out, wifi support is a good correction to a silly oversight on the E.
Not bad. I think $250 is a little high, especially compared to what you can get from Dell. But overall a good update. Attn: Ryan! Misinformation from P1 or a typo? It says there's 26mb free early in the release then a few paragraphs down it says 28mb is available. Any idea which figure is correct? I imagine a lot of users will be starved for space upgrading from T2s or T|Es and those 2mb of RAM might make a noticable difference in being able to have some breathing room. I have to admit being quite disappointed the price is $250. For $250, the memory should be double what it is now, NVFS or not! Part of the original attraction of the T|E was that it offered SO much bang for the $ at $200. While I could see $220/$225 for the E2 at launch, $250 is simply far too much, especially when you can get the lovely Zire 72s that trumps the E2 in multimedia features, formfactor (arguable), styling (arguable), and 32mb of old fashioned RAM. By the time this thing drops to $225 by this fall or the magical $200 price point by '06, there' no telling where the PPC market will be. Also, I doubt too many users will know/care about the Athena connector on the E2 as peripherals are still very scare and it doesn't come bundled with a cradle. Still it's nice to FINALLY see a serious commitment to a connector; it's somethign we haven't seen since '02 when every single model Palm released had the UC other than the first Zire. Its 29.8MB usable actually. The screen is quite awesome, no pic will translate how much better it is than anything besides the m515. I like it and think that the consumer market will, if not for any other reason than the NAND RAM (which my intital survey of PG County employees is a nice thing to have compared to even wireless abilities). Yes, the release I got from palmOne must have had a type on the available RAM. After a hard reset, the TE2 shows 29.7 MB free. Thanks. twizza, thanks for the link. >>>p32MB of non-volatile flash memory with 29.7 MB actual storage capacity gives Tungsten E2 handheld users more than enough room to hold their calendars, contacts, applications, photos, spreadsheets and presentations. What kind of pills are these people popping? I wouldn't be able to transfer everything I have from the TE to this! On the E2 you dont need this program. It is much more efficient than the TE was, it walks that same power drain line the T5 does, and the T5 is a beast - not as nasty as the TH55, but quite better than most else out there. MC: What kind of pills are these people popping? I wouldn't be able to transfer everything I have from the TE to this! Sarcaism is just light on my part, anything more than that would be crossing the line on my end. I try to stay away from the need to use stars and what have you. I have more than just myself that I represent when I am online try not to cut up too much. That being said, some of the sniping that has been happening on PIC lately is quite childish. I appreciate one's opinion as much as another's but the personal attacks frankly add nothing to the content of the convo. No need to call out names or anything, but just in general, I try to hold myself to a higher standard than the norm. I think Mike that the E2 would be right up your alley. I surmise from your S320 and TE days that you look for value predicated functionality. The E2 more than fits that, and gives you enough without being fluffy. Seeing also that the E2 supports the palmOne wifi card (soon to be $99 - which means even less at other places) makes for a nice solution for the mobile writer such as yourself Mike. Oh look at this! twizza forgets his Bible training! Want a freakin smack, do you? Turn the other cheek afterwards, so I can do it too! Covering up that you didn't try SilkDimmer, are you? No forgetting of Bible traning, just stepping up a bit, and as I said in the last post, I am stepping back. I'll try Silk Dimmer, but never really *wanted* it. I usually dont try programs that I wouldnt forsee a need for. But in this case, I'll do that and the G1 hack for those who've asked. Thanks, twizza. That'd be appreciated. I'm eager to know about Silk and *everyone* wants to know if G1 has been resurrected. Geez -- will we have to go through all this for G1 with *Cobalt* too?! Oh, just saw your other post, twizza. Well, having this loaner TE from Ryan has been pretty traumatic. The G area has been crap since Day One and there's been a creeping paralysis of the entire digitizer that is still progressing. Otherwise, the speed compared to the S320 has been a revelation. And color is a great step up too. Gekko, that was uncalled for. You and I snipe at each other because we like to. Denigrating twizza's beliefs like that is poor form. But then, you never have good form, do you? And twizza, I'm sure, knows I was being a **** (my asterisks, put as many as you like for a proper label). They added 180mah to the battery, so that combined with the NVFS should improve battery life. This works for me. At $250 it will sell well sans the moaning college students and retail slaves that post here. One of my fav scriptures is in Matthew 7 where it says simply to judge not lest that same judgement come back to you. I know that I laid myself out there when I said that, and do not mean to take it back. More often than not I try to read above the comments people do back and forth and just get to the meat of the issue. I didnt this time. If doing that offened you or anyone, please accept my apologies. MC: If I offended you, didnt mean to. Not to justify it in saying that I was being sarcastic. I said what I felt at that moment. If I offended you, I apoligize. Now that I have done my part in taking this part of the thread off topic, I will sign off for the night. Peace and blessings to all. I do not want to corrupt thee, 'Toine, for thou art reborn in the Holy Spirit. Bless you, my son. "Blessed be the CLIE users, for they are the Chosen Ones. Let him that hath understanding reckon the number of The Beast. For it is of human number. And its number is Tungsten 5." One day Naomi her mother-in-law said to her, "My daughter, should I not try to find a home for you, where you will be well provided for? Is not Boaz, with whose servant girls you have been, a kinsman of ours? Tonight he will be winnowing barley on the threshing floor. Wash and perfume yourself, and put on your best clothes. Then go down to the threshing floor, but don't let him know you are there until he has finished eating and drinking. When he lies down, note the place where he is lying. Then go and uncover his feet and lie down. He will tell you what to do." I will do whatever you say," Ruth answered. So she went down to the threshing floor and did everything her mother-in-law told her to do. Who are you?" he asked. "The LORD bless you, my daughter," he replied. "This kindness is greater than that which you showed earlier: You have not run after the younger men, whether rich or poor. And now, my daughter, don't be afraid. I will do for you all you ask. Oh look. S/he learned a new word today: "Vile." No doubt by looking in the mirror. You must have thrown a party yesterday -- implants are coming back. Better buy as many as your CLIEs! twizza: I wasn't offended. If anything, I was surprised that came from *you*! There are Bad Influences here. Satan lurks. Don't forget: PPC = 666! Take a treo 90 shell, put a bright 480x480 screen, loose the flip lid, put bluetooth, wifi, media player which plays native files without conversion, file manager, palmBEOS 6, 600mhz processor, 256meg nvram and call it a day. My T|C is getting old and when I pull it out of my pocket sometimes the styles goes flying out. Something as thick as the current T|C should have a 20 gig harddrive in it at least. Puleezz palm one update it pretty please!!!! RE: where's my T|C update? I have the same problem with my stylus on my older TT. Try wrapping a single layer of scotch tape around the stylus, that should do the trick. I suggest you do this now as I lost a stylus when i just ignored the problem (hoping it would go away on its own). I like the specs above - just right. Why doesn't Palm come up with another keyboard unit. Once you get into it you won't go back. the stylus is also useful but not for dealing with text entry. Take a Game Boy Advance SP. Make the case metal. Mount a 320x320 screen in the lid. Put a d-pad, two app buttons and a keyboard where the GBA controls are. Put in two SD sockets, add WiFi card support. Add built in bluetooth, and a replaceable battery. ...and it'd be guaranteed to have better hardware buttons/d-pad! And it would have a decent screen and keyboard. I looked at the UX50, but the screen was so dim, and the keyboard so mediocre, that it wasn't even tempting. Plus, there was the Memory Stick issue, which is a show-stopper now that I've bought into SD for my devices. Lack of a keyboard is what cripples all the other Palms - even I think this up-coming Life Drive (as well as the fact that its processor is really no faster than a T|C, I mean 16 Mhz). The big drawback to a PDA is getting the data in, particularly text, with a keyboard on the unit its made a lot easier. DocsToGo is very good and syncing with the desktop is great but you have to get the text in somehow in the first place to make the PDA an effective tool. I wrote large parts of a book using memo pad and a Palm VX (sometimes with a fold up keyboard) sometimes just using the stylus and it was a nightmare. Lack of a keyboard is what cripples all the other Palms - even I think this up-coming Life Drive ... The big drawback to a PDA is getting the data in, particularly text, with a keyboard on the unit its made a lot easier. I respectfully disagree. I hate thumbboards. I'm at least twice as fast with Graffiti as I am with a thumbboard. And if I really need to enter text, I've got a portable keyboard. The buttons on thumbboards are too small to be useful for me. I have difficulty pressing just one at a time. And I know others who share my opinion of thumbboards. Lack of a thumbboard may make using a Palm difficult for some. Others of us are glad for the absence. Palm Pilot Pro -> III -> Vx -> m500 -> m515 -> ??? So don't buy a device with a thumb-board. You at least have plenty of options. We who like them don't, hence our complaint. I completely agree that those who like thumbboards don't have many options in the Palm PDA market save the TC and the Treo 6xxes. And there probably should be more thumbboarded models. But the point wasn't about availability of thumbboard equipped PDAs, it was about whether or not the lack of a thumbboard is a "crippling" design flaw. Annoying for those who want a thumbboard, to be sure. But hardly "crippling." Though, "crippled" certainly sums up my thoughts on text entry with G2. Your mileage obviously varies. I'm curious: do you view your handheld as primarily a text-based device? Because for me, it's very much a replacement for a paper notebook. On the postion that G2 is a "crippling" feature, you and I agree. I don't like the changes made to make G2 function. As for my use, I use my Palm as a replacement for my paper dayplanner. I also use it for some basic wordprocessing and note taking (Wordsmith). I do a little budgeting on it (Quicksheet). And I use it to take some of my frequently needed databases with me (Smartlists To Go). Of course, there are some games on it as well. But most of my use of my m515 is interactive - that is, I don't read ebooks or websites. I'm using it for data or text entry and recall. It's a handy little tool, and the m515 still looks stylish - unlike some of the recent offerings (Tungsten T series aside). Good feature set, but should have listed for $199. $199 would have appealed to a LOT more people than $249 will. $199 is the most important "sweet spot" for PDAs these days. At "less than $200", the Tungsten E was more or less an impulse buy for a few people in brick & mortar stores. The TE²'s extra $50 is likely to cost Palm quite a number of sales. The PDA sections in many retailers like CompUSSR and Staples has been reduced to an embarassingly-small 6 foot counter littered with old, broken display models. On the surface, at least, the TE² appears to have what it takes to steal the spotlight from the lower end PPCs. RE: Good feature set, but should have listed for $199. I think a small price drop could help sales. It's also worth mentioning that the TE is the best selling Palm handheld ever, so I can understand P1's reluctance to mess around with a winning formula. As for why it didn't have 64Mb RAM, with that amount it could damage sales of the T5. This is "pricing by the book". You start at a higher price point to get money out of people who will buy it just because it is new, it also helps cleaning any TE inventory that is left. Latter you drop the price.